The Oseberg ship burial is a Viking Age burial mound containing a double female inhumation, which is located in the Oslofjord area in Norway. Through dendrochronological analysis it has been possible to determine the year in which the timbers of the grave chamber were felled, and the burial has consequently been dated to AD 834. The burial was formed by pulling a ship ashore, placing it in a trench, and building a grave chamber on its deck. The aft and fore of the ship, together with the grave chamber, were then filled with a large amount of grave goods; the fore of the ship was also occupied by many sacrificed animals which, because of their position, are thought to have been killed outside the ship and then placed on it. The Oseberg mound was first excavated in 1903 and 1904, and since then it has been studied extensively. Many aspects of the burial have been considered by scholars, who have tried to reconstruct the events of the early 9th century in order to explain its grandness and significance. The mound has provided much interesting and unique archaeological material, thanks to the excellent preservation conditions which enabled wooden objects to survive underground for almost 1200 years. Probably the most important part of this burial is the wonderfully carved ship, which is 21.5 meters long and 5.1 meters wide. 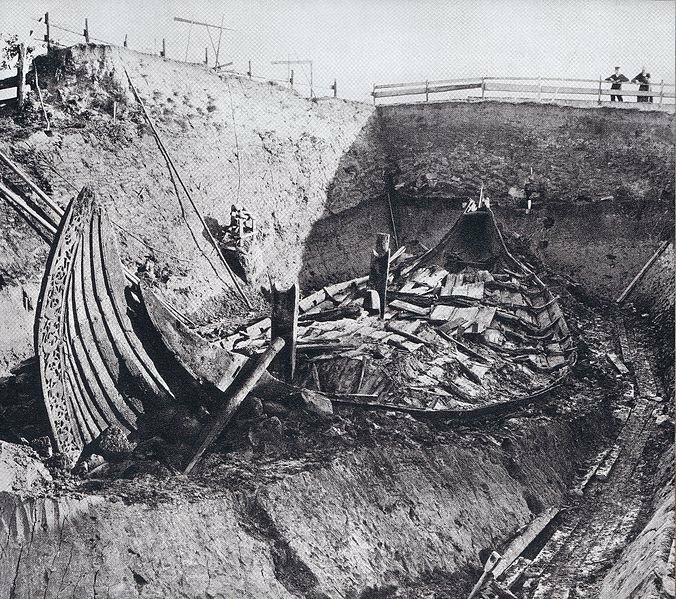 This ship, an early Viking Age construction, was useful in increasing our knowledge of Viking age ship building and sailing. Although it is thought by some that it was not suitable for ocean voyages, it is nonetheless very well built and highly decorated. Other important finds from the burial include decorated wagons and sledges, a wide variety of everyday objects and some woven tapestries. When first excavated, the burial was thought to be that of a Viking Age chieftain, but it soon became apparent that it was lacking the weapons and other artefacts common in male graves, whilst it abounded in everyday objects such as kitchen utensils, which are normally associated with females. The discovery of two human skeletons instead of one also came as a surprise. Further studies proved that the burial was a double female inhumation and this led to it being labelled “unique”. There has been much speculation about who was buried in the mound and about which one of the two skeletons was the most important figure.